"If you have an espresso maker in your home or office, you can whip up this spicy seasonal favorite." See how easy it is to make your favorite fall latte at home. Gingerbread flavored syrup is available seasonally in some markets. Look for it in the flavored syrup aisle. You can also order it from several online sources. 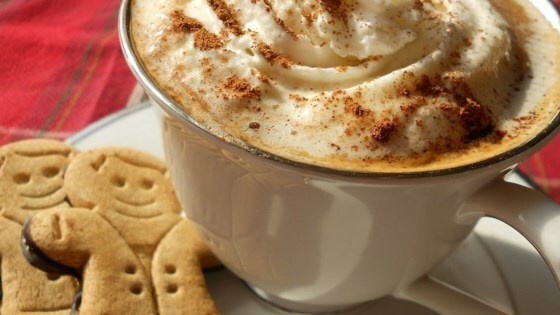 I used Billy's Homemade Gingerbread Syrup in this coffee. This was so comforting this morning, the smells just made my stressful morning melt away. You can purchase gingerbread syrup at Starbucks for $9.95. They even gave me a pump to go with it! AWESOME!!! This absolutely SCREAMS Christmas! I think this will be a new Christmas morning tradition in our home! A yummy recipe! Delicious on a cold (esp winter) morning. Absolutely delish! I usually have a white chocolate mocha in the morning, but I am definitely switching for those cold winter days! thanks! This recipe was very good. I substituted vanilla soymilk in for the milk, and it still turned out wonderfully. Thanks so much for posting this!